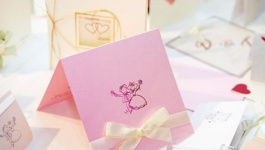 Thinking about creating your very own wedding stationary but you aren’t sure how you can possibly get it all done? A trick that a lot of do-it-yourself brides use is stamping. Stamps will give your wedding stationary that professional touch while also saving you a whole lot of time from writing out your own details over and over again. There are a whole lot of different size options out there when it comes to stamps, so you need to e sure that you choose a size that is going to be appropriate for your invitation. This means that you have to do a bit of preplanning and envision what your invitation is going to look like. You must know whether you need a large heart stamp, or a small heart stamp. If you buy a stamp the wrong size, then you can consider that to just be wasted money. What ever you put on your invitations and other wedding stationary will speak volumes about how your wedding is going to be. Make sure that when you do choose stamps to use on your wedding stationary that it will match the theme and the tone of that day. If you are having an elegant wedding, then having soft and more ornate stamps is more appropriate than any stamp that may include thick, harsh lines and more modern themes. Should you choose a more detailed stamp, practice before using these on your cards. The more detailed the stamp, the harder it is to use. It’s important to consider that every different type of stamp has been created to create a different type of effect. Make sure that you don’t go for an inferior quality stamp when purchasing, as you can then expect inferior quality results. A rubber stamp may be any where from $1 to $20, or even more depending on the size and detail. Though the stamp alone may not cost a lot, think about the other costs that accompany it: the cost of ink, the cost of the paper to use for the stationary, embossing powders, and perhaps most importantly your time. Do-it-yourself wedding stationary is a great way to save money and to add that personal touch at the same time, but it will require you to spend several nights on the couch (perhaps with your bridesmaids or your groom) creating beautiful, unique wedding stationary.